Maximum 25 watts ERP, may not have an antenna elevation of more than 25 feet above ground level, and must use PL encode/decode or similar access management methods. The LARS frequencies are 440.2250, 440.7500, 442.1000 and will be assigned on a diversity spaced basis. The Frequency of 440.2750 has been established for use as a portable or temporary repeaters. The implementation of access management such as PL encode/decode is strongly recommended. No permanent/fixed repeater systems maybe established on this frequency. 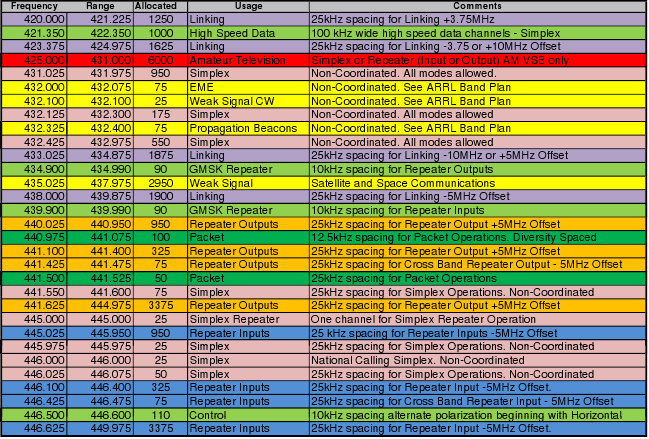 The following frequencies have been set aside for Winlink 2K frequencies for WL2K RMS gateway operations exclusively.